In October 2017, Guillermo “Willie” Rodriguez (B.A. ’11) was promoted to assistant director of The Arc of San Antonio’s Wurzbach Road location, a childcare and day habitation for adults with intellectual and developments disabilities. Rodriguez, who’s made a career working at The Arc since 2012, at one point never foresaw that he’d be helping those with special needs. After graduating from St. Mary’s University in Spring 2011, Rodriguez left to Seattle after receiving a fellowship to earn a doctorate in public administration, a seemingly fitting continuation of his Political Science education at St. Mary’s. At the time, Rodriguez was certain he’d spend his life in academia. But four months into the doctoral program, he came to the tough realization — it wasn’t for him. After returning to his hometown of San Antonio in January 2012, Rodriguez remained unemployed for three months. “I was aimless,” he said of that time. He soon reached out to The Arc — a move that changed his career. Rodriguez first heard about The Arc in 2011 after he took a position there that summer as a lifeguard, watching over program participants and teaching them how to swim, blow bubbles and play volleyball and soccer. “All that care we took was what I really liked doing,” he said. After that summer, Rodriguez stayed on staff part time as a life enrichment instructor. “Looking back, it wasn’t at all what I thought I’d be doing,” he said. Fast forward to today as Rodriguez helps manage an organization that provides daily care to “one of the most underserved communities not just in San Antonio, but in the nation,” he said. According to The Arc’s website, as much as 12 percent of the adult population in Bexar County lives with an intellectual or developmental disability. Much of the responsibility of their care rests on their families. “After aging out of public schools, they are on their own essentially,” Rodriguez said. That’s where The Arc comes in, where professionals like Rodriguez have invaluable access to many special adults, teaching them life skills such as handwashing, reading and conversing — “all the skills you take for granted,” he said. Rodriguez also ensures the staff he supervises work to make their clients feel enriched and fulfilled. This lightens the stress for family members, knowing their loved ones are being cared for during the day. 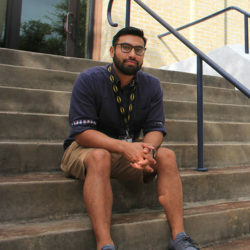 While Rodriguez’s original plans to become a political scientist may have changed, he said he couldn’t be happier where he is now, serving those in need every day, living out a vocation he never imagined.